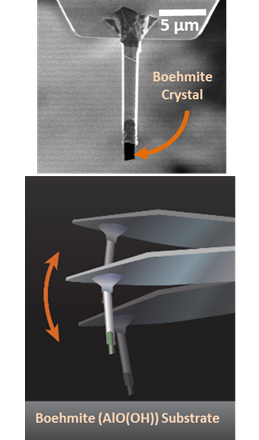 Top: Modified cantilever with a boehmite crystal mounted to a silicon post, which is mounted to the AFM cantilever. Bottom: Interactions between the modified cantilever and a boehmite substrate are quantified as a function of solution conditions. Enlarge Image. Forces between individual particles in slurries are responsible for their rheological behavior. 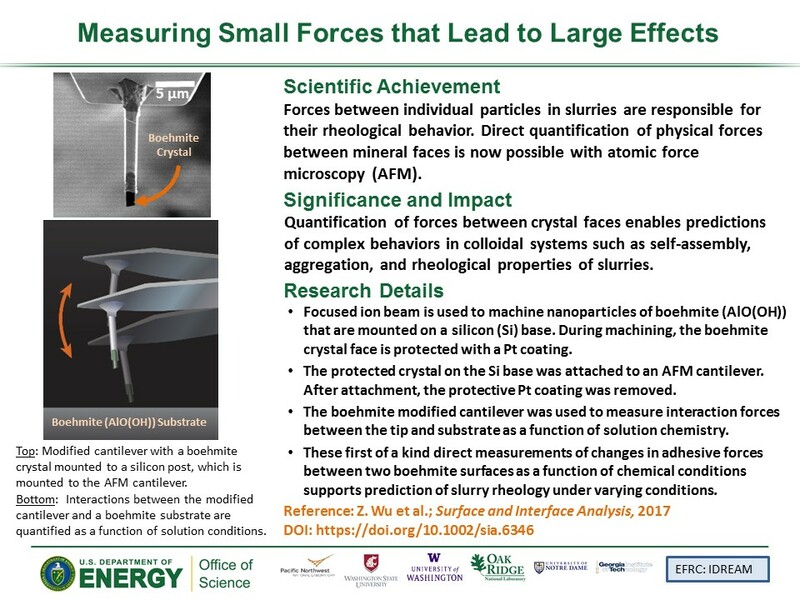 Direct quantification of physical forces between mineral faces is now possible with atomic force microscopy, thanks to work at IDREAM, an Energy Frontier Research Center (EFRC) funded by DOE's Office of Science, Basic Energy Sciences. Why It Matters: Quantification of forces between crystal faces enables predictions of complex behaviors in colloidal systems such as self-assembly, aggregation, and rheological properties of slurries. Summary: Forces between nanocrystals are the basis for many generic (e.g., random aggregation/assembly and rheology) and specific (e.g., oriented attachment) phenomena in slurries. Detailed knowledge of these molecular-level forces is needed to explain and predict such macroscopic phenomena. Researchers can now directly measure these forces via atomic force microscopy (AFM). Using microfabrication methods, AFM cantilevers are modified to mount directionally oriented crystals tips. To simulate a slurry environment, the tip is placed above a well-characterized substrate in a flow-through cell where the aqueous chemistry of the system can be controlled. Changes in the force of interaction between the tip and a substrate are measured as a function of chemical conditions. This approach can be used to attach virtually any crystals to an AFM cantilever. Sponsors: This work represents a collaboration between IDREAM (Interfacial Dynamics in Radioactive Environments and Materials), an Energy Frontier Research Center led by Pacific Northwest National Laboratory (PNNL) and an early career award also at PNNL. Data interpretation and theory were supported by IDREAM; development of the microlithography-based tip fabrication was supported by the early career award. The Nuclear Process Science Initiative (NPSI), a PNNL Laboratory Directed Research and Development (LDRD) investment, was used to develop the materials synthesis and microfabrication capability using a focused ion beam. User Facility: Tip fabrication was performed in the Environmental Molecular Sciences Laboratory, a U.S. Department of Energy, Office of Science user facility sponsored by the Office of Biological and Environmental Research and located at Pacific Northwest National Laboratory.